“Come in, come in, Mass is at 10 am… but can I check your bag please? The conditions these days…” says the caretaker at the Presbyterian ARP Church in Karachi. The ‘conditions these days’ is perhaps an obtuse way to describe what Christians in Pakistan are facing, and what transpired in Pakistan’s second-largest city, Lahore, last weekend. 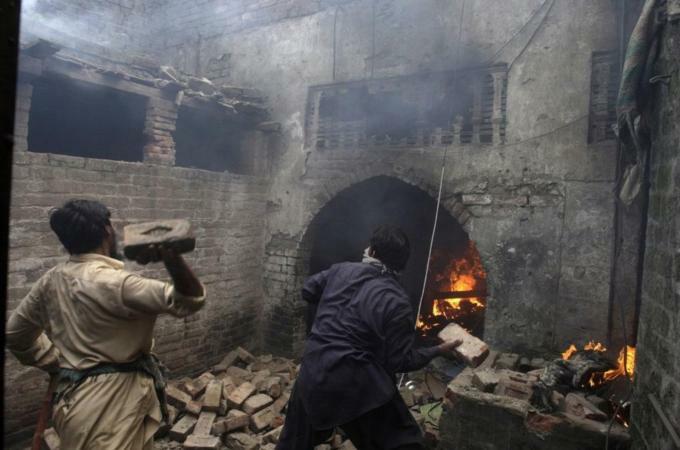 On Friday, Christian families in the Badami Bagh area of Lahore were forced to flee their homes after a 26-year-old Christian man was accused of committing blasphemy. The next day, over a hundred houses belonging to Christian families were burnt by a mob, venting their rage at the community over the alleged case. Images of angry men dragging possessions—including a cross—from the homes of horrified Christian families and setting them on fire dominated Pakistani television channels on Saturday. Over 100 suspects have been arrested by the police in connection with the attacks and several were presented in a court designated for terrorism cases on Monday. The account of how the allegation of blasphemy last weekend turned into a fiery pogrom is eerily reminiscent of similar cases across the country, evoking in particular the 2009 carnage in the village of Korian and neighboring town of Gojra in Punjab. Eight Christians were killed and scores of houses were burned down in a similar fashion after clerics instigated mobs to attack Christians, claiming that there had been an episode of blasphemy in Korian. The Gojra rioters were never brought to justice, and it appears unlikely – despite government assurances – that the prosecution of the Lahore attacks will be any different. Whether the 26-year-old, identified as Savan Masih, even committed blasphemy is entirely questionable. According to the Dawn newspaper, Savan and Imran Shahid, a Muslim barber, had argued recently. One resident claimed the two had been dealing in liquor and had fought, after which Imran accused Savan of blasphemy. The Pakistan Christian Post website says that Savan and a Muslim boy had quarreled over a snooker game. In Pakistan, it only takes a whisper, a rumor or one angrily raised voice crying ‘blasphemy’ to make an entire neighborhood the target of a violent mob, or for a public lynching of the accused. The numbers of blasphemy cases being filed in Pakistan – often on flimsy charges that cannot be proved – are racking up, dragging Christians, Hindus, Ahmadis and Muslims of rival sects into their net. According to the Pakistani constitution, people can be charged with blasphemy for defiling a place of worship, carrying out a ‘deliberate and malicious act’ – whether verbal or written – to insult a religion, defiling the Quran or using derogatory remarks about Prophet Mohammad. It is the latter that has been the most contentious and has led to vigilante mobs lynching anyone accused, since this offence carries the death sentence. Calling for a reform or repeal of the law, or preventing its misuse, has led to the undoing of a number of prominent Pakistanis. Punjab Governor Salmaan Taseer was assassinated in January 2011 by a member of his security guard who was enraged at Taseer’s comments about the misuse of the law. Two months later, prominent Christian activist and the Federal Minister for Minorities Affairs Shahbaz Bhatti was shot dead. On Sunday, the head of the Pakistan Ulema Council Allama Tahir Ashrafi warned ‘some NGOs’ against using the attack on Christians as a way to criticize the section of the blasphemy law that comprises the offence about Prophet Mohammad. The attack has resonated throughout Pakistan, including Karachi, where there is a sizeable Christian population of all denominations, including 166,000 Catholics. And while the textbook blasphemy cases that have engulfed the Punjab province haven’t been as prevalent in the city, the sense in the community is that Karachi is gravitating the same way. “If this (attack) happened to so many people today, tomorrow it can happen to us too,” said Amos Kaleem, a young man in his 20s. The Christian community in Karachi is in the midst of a fundraising drive for the victims of those who died in a bomb blast at a Shia neighborhood last Sunday. On this Sunday, they were praying for their own in Lahore. At St. Peter’s Catholic Church, worshippers at Sunday Mass – a majority of whom are migrants from Punjab – bowed their head in prayer, and listened intently as Fr. Saleh Diego moved away from scripture to sadness.